Last week we saw a little about the latest dust extraction accessories Makita announced at WOC, and today I have some more information from a new press release to share. The new dustless hammer attachment works with Makita SDS-PLUS corded and cordless rotary hammers. It features a 17" hose, telescoping spring-loaded barrel, depth stop, bit size adjustment knobs and a built-in ruler. World of Concrete attendees tried out Makita's new attachment and discovered several advantages versus competitive built-on systems, including better tool performance (competitor built-on vacuum motors share power with the tool resulting in less impact energy/BPMS), and longer cordless run time (battery has to power both the vacuum and tool motor on competitive tools, decreasing the tool runtime on one charge). 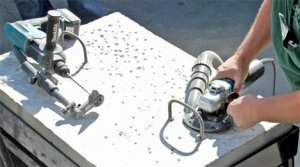 Use of this attachment with most jobsite vacuums results in better suction and more efficient dust extraction. Because there is no vacuum motor or components attached to the tool, the Makita solution is more compact and has less weight than built-on systems. Lastly, most built-on systems have only a half-gallon capacity, increasing downtime from the frequent disposal of the collect material. Makita's new grinder dust shroud is designed to fit Makita 4-1/2" – 5" grinders. It features a spring-loaded suspension system that keeps the shroud flush to the surface during movement and compensates for blade wear. The shroud has a removable edge piece for surface work flush to edges or other objects. It also has soft brushes that help contain the dust and allow for smooth movement over the work surface. The outside diameter of the extraction port will work with most standard vacuum hose systems. The new dust shroud is ideal for concrete finishing, concrete material removal and paint or surface coating removal. I am happy to see that Makita is providing accessories that will help prevent dust from getting into the air and more importantly our lungs, and we all know how bad concrete dust is. So now that Makita has shown us these new dust extraction accessories, I am surprised that they have not come out with an actual dust extractor.